WASHINGTON - It's not come up in any of the Republican presidential debates as he struggles to keep his campaign on course. He isn't faced with questions about the incident on the campaign trail. Animal rights activists haven't been heckling him in Iowa. But it's a true story with a Canadian angle: Mitt Romney once made the 12-hour drive from Boston to Grand Bend, Ont., with the family dog strapped to the roof of his car. New York Times columnist Gail Collins has refused to let the largely forgotten story die, mentioning the incident as many as two dozen times since Romney entered the Republican race for president, both in 2007 and in 2011. She even hoped John McCain would tap Romney as his running mate three years ago "so I can repeatedly revisit the time Mitt drove to Canada with the family dog on the station-wagon roof." And just a year ago, Collins had an idea for a Christmas gift for the former Massachusetts governor: "A tasteful Mitt Romney Christmas ornament" depicting the scene of Seamus, the Irish setter, on the roof. The Boston Globe first broke the story in 2007 when it published a seven-piece profile of Romney after he launched his first presidential run. The Seamus incident was contained in a story about his family life with wife, Ann, and their five sons, and meant to illustrate Romney's "emotion-free crisis management." In 1983, Romney was struggling to cram the kids and all their luggage and supplies into the family station wagon for the long drive to the Lake Huron shores of Grand Bend, where his family still owns a cottage at Beach O' Pines, a mostly American enclave in the area. "Before beginning the drive, Mitt Romney put Seamus, the family's hulking Irish setter, in a dog carrier and attached it to the station wagon's roof rack," the Globe wrote of Romney, then a 36-year-old management consultant with Boston-based Bain and Company. Romney constructed a special windshield for the carrier, "to make the ride more comfortable for the dog." The contraption apparently wasn't much of a success, however, as Seamus soon began to suffer gastric issues from his windy perch atop the car. Romney's oldest boy, Tagg, noticed the first sign of trouble, according to the Globe piece. ''Dad!'' he yelled. ''Gross!'' A brown liquid was dripping down the back window of the station wagon. Romney calmly dealt with the problem amid his boys' howls of disgust, pulling into a service station to hose down Seamus and the car. He put the dog back in the crate and continued the drive to Ontario. The story caused a flap when it was revealed four years ago. "If you wouldn't strap your child to the roof of your car, you have no business doing that to the family dog," said Ingrid Newkirk, president of People for the Ethical Treatment of Animals. "I don't know who would find that acceptable." To Time magazine, she described the incident as "torture." "Poor Seamus Romney," the Boston Globe's Scot LeHigh said of the revelations contained within his colleagues' profile. "Who, really, can blame Seamus, riding up there alone and forgotten, eyeing each approaching overpass and anxiously wondering if Mitt had calculated the clearances correctly, while the rest of the Romneys were safely ensconced in the vehicle below." 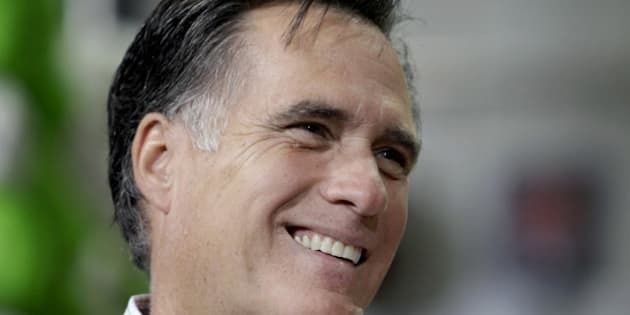 Romney said in 2007 that PETA was targeting him because, as he ran the Salt Lake City Olympics five years earlier, he OK'd a rodeo being held as part of the festivities, and because he once went quail hunting. "And they're not happy that my dog likes fresh air," he said, adding the late Seamus loved riding in the carrier. "He scrambled up there every time we went on trips. He got in all by himself and enjoyed it." The blowback even prompted Ann Romney to take to her sons' now-defunct blog to insist her husband was a dog-lover. "Mitt and I love our dogs," she said. "Seamus was our first — an Irish setter. When I wasn't at home, Mitt let him sleep on the bed. And usually when he was riding in the car, his head was out the window. Seamus lived to a ripe old age, basking in the affection of a large family." So what happened to dearly departed Seamus? The dog, who had a penchant for wandering away from the Romneys' Boston home, ended up retiring to California with Romney's sister, Jane, who had space for him to roam freely. Jane Romney referred to him as "Mr. Personality" who arrived at her home detesting cats but before long was the loving protector of a litter of kittens. In Romney's second run for president, Seamus has largely been forgotten — except by Collins. The Times columnist raises Seamus almost every time she writes about Romney, who's currently dealing with a soaring Newt Gingrich, surpassing him in the polls with less than a month until primary season officially kicks off. "Maybe we could get over his driving to Canada with the family dog strapped to the roof of the car if he'd just admit it was because he was too cheap to hire a dog-sitter," Collins wrote on Dec. 1.